New paying member? 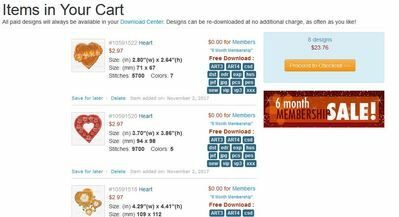 Put designs in your cart? No panic, you don't have to pay for them. Go to the cart - and you see the designs you ordered. And the blue buttons for the different formats - see picture #1. Click on the format you need - I chose vp3 - see arrow 1 in picture #2. Save the design. Now click on the delete mark - see arrow 2. It is now deleted from your cart. Continue to do the same for all designs in your cart. Do NOT use the 'Proceed to Check-out' button or you will be charged. 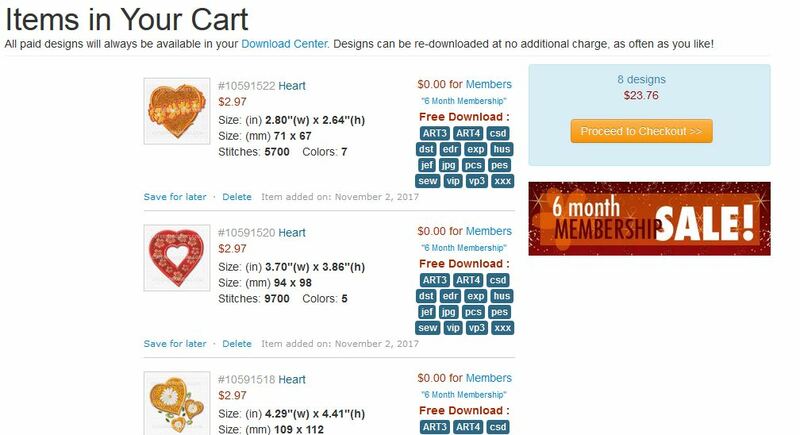 The easiest way is not to put designs in your cart, but to click on the picture and download from the pop-up page, as described in another post - see link below.